Charles Moïse Briquet was something of a genius. He smashed the long-cherished fallacy that early paper was made from cotton rags, systematically visited a hundred archival deposits on the Continent, organized 60,000 tracings by subjects, types, and dates, and, growing blind from his Herculean endeavours, brought the four volumes of Les Filigranes to publication in 1907. As we turn from the articles and monographs that Briquet wrote, mainly in preparation, to his magnum opus, to the consummation itself – words almost fail us; but admiration never. So comprehensive is this dictionary of watermarks, so well-balanced in its coverage of every region and decade within its defined limits, so accurate its tracings and its annotations of time and place and meaning, so plentiful its historical accounts of mills and master papermakers, so selective and yet abundant its provisions for future use and study [...] But words (I said) fail us. [...] Countless students and scholars have tasted the book, and some have used it. Recently a number of critical evaluations of Briquet and his great work have been printed in The Briquet Album (1952) [...]; and thus I need hardly praise what has been amply praised. Except for one personal remark: after a good many years of use, I am still finding in Les Filigranes the answers to problems that suddenly for me are new, or, more often, material whereby I may search out fuller answers than Briquet had opportunity to provide. Briquet evokes the detective instinct that is in all of us. What, finally, is the significance of twinship? Stevenson did not “discover” the twinship of moulds. Hand papermakers had always known, and continued to know, about twins. Twin moulds are listed in scattered business records of paper mills, and their use is described in various eighteenth-century accounts of papermaking. The great historian of paper Charles-Moïse Briquet wrote with precision of twin moulds, and reproduced several examples of twin marks. Even in Greg’s classic study of “False Dates” there is clear reference to twinship, derived from Briquet, and yet Greg manifestly failed to see its application: “. . . technical evidence goes to show that a pair of frames could perhaps be made to last two years . . .” (p. 121). It was Stevenson’s achievement to see that twinship had a methodological point: a paper stock is only defined when both its twins can be identified. In the film The Third Man (1949), based on a script by Graham Greene, appears probably the most famous insert made by an actor to a screenplay in the history of cinema. The mysterious, elusive Harry Lime – played by Orson Welles – unforgettably links evil and creative genius, when he says: “In Italy for thirty years under the Borgias they had warfare, terror, murder and bloodshed but they produced Michelangelo, Leonardo da Vinci and the Renaissance. In Switzerland, they had brotherly love; they had five hundred years of democracy and peace and what did that produce? The cuckoo clock”. However memorable, the interpolation is disturbingly inaccurate on two separate counts. First, although its origins are obscure, the cuckoo clock was not invented in Switzerland, but in southern Germany: the earliest examples go back to the Seventeenth century, but production really took off in the Black Forest area after 1740. (After the film came out, Wells said that he had received polite letters from Switzerland, correcting his mistake.) Second, at least as far as paper historians are concerned, it makes no mention of Charles-Moïse Briquet (1839-1918) . To say that Briquet is Switzerland’s most famous son might be an exaggeration, since William Tell and Roger Federer both stake strong claims to the title. On the other hand, instead of spoiling a perfectly good apple or beating hell out of innocuous tennis-balls, Briquet has given us something truly aere perennius. Over a century has passed since the first publication of Les filigranes in 1907 (and with all the ridiculous centenaries that we have had to suffer of late, it is a shame that this one event passed unremarked), the physical importance of these four tomes for scholarship is well-known to rare-book librarians, if only for the frequency with which they send them for rebinding. Briquet was not a professional scholar. He was Swiss and too respectable for that. He was instead a business-man, whose interests included a stationary firm and a small publishing house, specializing in producing lithographic views of the Swiss scenery, but he also came from a long tradition of papermakers and paper merchants. In Les filigranes, after his wife and the memory of his father, he dedicates the work “à l’honneur des Industries du livre (papeterie, imprimerie, reliure, librairie) exercées dans ma famille, dès 1687, à Châlons-sur-Marne et à Genève, par sept generations successives”. As a young man, he was employed in the family business, but also took a year out to work in the papermaking mill, La Bâtie, on the river Versoix, near Geneva, which ceased production in 1880 and today is little more than a ruin. He was curious about early documents and palaeography and, according to his own account, first became interested in watermarks in 1878, when he undertook to give a picture of paper production in Switzerland in the Middle Ages, discovering that there were hardly any previous studies in what should have been an important field. It was only ten years later, however, when he retired from business, that he set in earnest to creating his famous repertory. Briquet’s great, unquestionable quality, which raises him head and shoulders above all scholars of paper before and since, is his mobility. After retiring on 1 January 1887, at the youthful age of 47, he departed – accompanied by his wife and presumably a servant or two – for six months at a time, staying in good hotels and using the newly created European railway network to move with comfort and probably a fair amount of luggage (especially compared to today’s aggravating Ryan Air standards). Each journey was planned in scrupulous fashion. He wrote ahead to the directors of archives and libraries, advising them that he was coming and describing the sort of material he desired to see. Considering that at the time he was known at best as the author of a few articles, he obtained a surprising amount of collaboration (or the archivists and librarians of the time were more receptive and helpful than their modern-day counterparts). Obviously there were some places he didn’t go: Great Britain, Spain, the Scandinavian countries, some bits of Eastern Europe, and Russia all remained off the map, but since up to his cut-off point in 1600 hardly any of the paper used in these outlying areas was produced domestically, this was no great loss. Even in important countries a few towns were missed: Arezzo in Tuscany is one notable absentee, Ferrara in Emilia-Romagna is another, and he also for the most part steered clear of centres such as Fabriano, which had already been mapped or where others were working. But on the whole the depth and extent of his coverage of the territory was and is extraordinary. The rapidity and the comprehensiveness with which Briquet constructed his masterpiece comes however at a sort of price, which it is needful to understand, if his endeavour is to bear proper fruit. Unfortunately this does not always happen. Les filigranes is not in the situation of Richardson’s Clarissa or De Tocqueville’s De la démocratie en Amérique in being a book that everybody knows and hardly anybody has read, since it was never intended to be read in its entirety; on the other hand, most people who use it, even use it quite frequently, treat it as a picture book with captions. Quite apart from the fact that it is a heinous sin not to read Briquet’s eminently concise introduction, anyone needing to know the history of a particular design should at least peruse the summary placed at the beginning of each lexical heading. It is a very good idea moreover to hunt out and read carefully Allan Stevenson’s superb preface or re-introduction to the 1968 Jubilee edition, which explains how to make Briquet your friend and helper. According to the introduction in Les filigranes, in just under twenty years of ceaseless effort, Briquet, covering the length and breadth of Europe (almost), visited 235 archive and manuscript collections, as well as libraries for about a thousand printed items. In the said travels he examined 30,840 volumes, as well as 1,432 documents in unbound form, in particular letters, from which he made a total of 44,000 tracings and recorded 65,000 references to the same. The original tracings made by Briquet on his travels were fiddly and too fragile for continuous use, so after his return he recopied the designs onto more robust pieces of paper, which now form a sequence of twenty-four ring folders in the Briquet archive at Geneva (Papiers Briquet, nn. 51-74). This working material was supplemented by freehand drawings of watermarks, where tracing had proved impossible, and items copied from other previously published sources. When published after twenty years of intense labour, the final work reproduced 16,112 designs and for its geographical sweep and historical depth remains one of the great all-time works of scholarship. The whole of Briquet has now been put online in a splendid project, guided by Ezio Ornato and the Laboratoire de Médiévistique Occidentale de Paris (LAMOP), hosted inside the ‘Bernstein Memory of paper’ website of the Austrian Academy for Sciences . The Bernstein interface makes it possible to interrogate Briquet in topographical and chronological fashion, though of course the reversal of a paper repertory into an electronic archive involves a number of pitfalls, such as multiple entries when Briquet gives a range of dates for the same watermark. Nevertheless, it is simple, friendly, convenient to use, and I like it a lot. Were I to venture a criticism, it might be to say that a note field is required for updates and additions, beginning with the thousand or so ‘Addenda and Corrigenda’ added by Allan Stevenson to the 1968 Jubilee edition (pp. *55-*86). After Briquet’s death in 1918, his heirs donated his working archive to the Bibliothèque Municipale et Universitaire in Geneva (which in 2006 was renamed, more simply, the Bibliothèque de Genève). Although the collection is devoid of personal papers, in particular the correspondence, study of the same reveals much about Briquet’s method and how he constructed his repertory. While travelling, he made his tracings on small rectangles of transparent paper, measuring approximately 120×95 mm. All the images, both used and unused, received a number in red ink, which refers back to the sequences of documents in the archives and libraries he visited. These same numbers, again in red ink, are introduced, probably after his return home, into the travel diaries, where the original record was written in pencil, as well as into the descriptions in the working archive in ring-folders. Once the final selection had been made for publication in 1907, after their return from the printing shop, the 16,112 published images were numbered, as in the repertory, for the first thousand or so in a green ink with an underlining; afterwards, up to about n. 8000, with red ink in a circle, and finally with black ink in a circle. Subsequently, they were grouped thematically in yellow-paper envelopes and placed in the three boxes designated Papiers Briquet, nn. 75-77, in the archive. These images constitute the primary references, i.e. the image is reproduced and the source of the document is cited. The unused images were ordered in a separate sequence in boxes designated Papiers Briquet, nn. 78-82. The official total of the unpublished series is 29,728 tracings, arranged according to watermark typologies, thus forming a parallel, still imperfectly known, visual repertory (the total number of tracings therefore works out at 45,930, i.e. close enough to Briquet’s own indication). In the late 1990s, under the aegis of the Gravell Watermark Archive, coordinated by Daniel Mosser, the collection of Briquet’s unpublished tracings was reproduced digitally with the intention of carrying forward a project to publish them online. Although the online catalogue of the same has lagged and is far from complete (see below), these same digital copies can be viewed on a terminal in the Rare book reading room of the library at Geneva and copies of single sequences, or of the entire series can be purchased (at a negotiable price, i.e. in Swiss francs). As can be seen from what does appear online on the site of the Gravell Watermark Archive, the digital technology of only two decades ago leaves an increasing amount to be desired, nevertheless the whole enterprise is an important step forward. A brief survey of the unpublished images inevitably discovers that in many cases the tracings are imperfect or incomplete, so that Briquet for obvious reasons discarded them, while a fair number are after his chronological limit of 1600. More important for any future study is the fact that the majority of these images, as we shall see, are present in the 1907 repertory as secondary references, for which Briquet gives the place of use and the date, but not the name of the archive nor the precise identity of the document. Just to give an example of how swiftly and effectively Briquet worked, his short visit in 1898 to Udine, the capital of the Friuli area in North-east Italy (where I have a university job) provides a fascinating test case. A first exploration of the same was provided in a thesis by Isabella Garlatti presented in 2005 at the University of Udine, which all-importantly included comparison with a selection of the original tracings conserved in the Briquet archive at Geneva. Albeit a small, quiet provincial backwater, Udine was home to inventor Arturo Malignani (1865-1939), who two years previously had sold his light-bulb brevet to Thomas Edison and whose genius meant that Udine was the third city in Europe, after London and Milan, to have electric civic lighting. Ten years after Briquet’s visit it would also become one of the first cities to have an electrified tramway system. Following his pioneeringly famous incursion into Italian filigranology, with the publication in 1888 of a lengthy article with the watermarks of Genoa, Briquet had already undertaken another two large-scale Italian journeys, the first in 1889-90, in which he travelled through Sicily, visiting Messina, Catania, Syracuse, Agrigento, and Palermo, before returning to Naples by boat and, after visits to Amalfi and Salerno, travelling up the peninsula, with stays in Rome, Fabriano, Florence, Lucca, Bologna, Venice, and Brescia (Papiers Briquet, n. 40); the second took place from December 1890 to April 1891, in which he visited Milan, Siena, Pisa, Pistoia, Modena, Parma, Padua, Treviso, Vicenza, Verona, and Bergamo (Papiers Briquet, n. 41). Unfortunately, neither diary is specific about the exact dates nor the length of the stay in the cities along the way, though it might be possible to establish something from his correspondence, where it has been conserved by the archives and libraries he visited. From 1895, however, and his journey through Eastern and Northern France (Papiers Briquet, n. 44), Briquet recorded his movements in greater detail. His next journey involving Italy, albeit briefly, was mostly conducted in Germany, Austria, and Czechoslovakia. The stages are meticulously recorded in a small black notebook (Papiers Briquet, n. 45), showing that the trip began at Kempten on the 13th June 1898 and ended at Würzburg on the 2nd November (though presumably he got back to Geneva a few days later). Midway through the trip, he came to Udine on Monday, 15th August from Klagenfurt in Austria, whence he returned on the following Tuesday, 23rd August. These dates are confirmed by the letters he sent at the time to the city librarian at Udine, Vincenzo Joppi, announcing his arrival and asking for material to be made ready for him. The four pages of the diary dedicated to Udine include a long list, neatly written in pencil, of the manuscripts he looked at, or wanted to look at. Inevitably, the most fascinating part of the process is just this, to go back into the archives visited by Briquet and to look at the same documents in order to understand how he worked, what the choices he made were, and, equally significantly, what were the things he chose to ignore. Briquet’s principal objective in Udine, and most important source for the watermarks he included in his repertory, was the Annales, which is a huge continuous sequence of documents, running from 1347 up to the end of Venetian rule in 1797 (the record does actually continue till 1805), containing the records of the city council (Concilio maggiore). As with the rest of the Medieval archive, it is held in what today is the Biblioteca Civica “Vincenzo Joppi”, named after the librarian who in 1898 materially assisted Briquet with his research. The diary entries list volumes 1 to 66, i.e. from the Medieval beginning up to 1602, which had already been established as the cut-off date for his repertory. The Medieval part of the archive was originally formed by large unbound gatherings of paper, which were only brought together in volume form in the late Seventeenth century by the chancellor in charge of the archive, Andrea Brunelleschi. Briquet’s primary references cover volumes 1 to 42 of the Annales, ending in 1514, which he certainly therefore consulted. In terms of the primary references, some volumes are not included, but, from the unpublished material, it can be shown that they were nevertheless looked at: for instance, volume 2, covering the years 1353-60, is not mentioned by Briquet in the primary sequence, but four of its tracings in the unpublished archive were reproduced by Mošin-Traljić in 1957 (nn. 250, 4632, 6456, 7103, therein, see below). Likewise, the unpublished part of the archive, partially available through the Gravell Watermark Archive, shows a more extensive chronological progress, since references appear as far as volume 59 and the year 1574. Altogether some ninety primary references were taken from the Annales, with the prize for the greatest use, no less than fourteen, going to volume 35, covering the years 1476 to 1482. Next in order of importance were the Acta, or the deliberations of the Concilio minore (in modern parlance the Giunta), comprising 92 volumes from 1490 to 1799, of which Briquet in his diary entry records 1-29, covering the period 1490 to 1599. The primary references get no further than volume 8 and the year 1519; again, however, the unpublished tracings visible in the Gravell Watermark Archive reach volume 26 and the year 1587. Eleven primary references from this source were later included in Les filigranes. Third comes the sequence of Camerari, or account books, less complete in their coverage, for which Briquet lists in his diary 18 volumes, from 1297 to 1420, and again saw them all, since he cites volume 17 in his main sequence. Seven primary references were taken from here. The rest is made up with a miscellany of 23 manuscripts, in some cases single letters, in others documents from the notary archive, which furnish a total of another twenty primary references. When Briquet returned to Geneva and sorted out his travelling notes, the documents in the Udine archive recorded in the diary were numbered from 8981 to 9025 (though, as explained above, the usual colour is red, in this particular case the numbers are in black), keeping the final two numbers for the most important sequences, i.e. 9024 for the Annales, and 9025 for the Acta. It is important therefore to understand that the figures present also on the unpublished tracings are indexed to the archive series, so that the same number can appear on multiple images taken from the same source. To sum up, in seven days, considering travelling time, in high midsummer (albeit before Italians discovered that sun-bathing is the height of hedonism and thus became permanently out of the office), Briquet viewed something in the order of 130 manuscripts, most of them bulky, composite volumes, and collected 131 tracings for which Udine provided in most cases the earliest known instance of a design and 144 others, which were not included in the final repertory, but for which Udine is given as a secondary reference. This total of 275 items is less than the full count, since further tracings, albeit not a large number, were wholly discarded in the sorting and selection phases, while the secondary references frequently cover groups of images (see below). As has already been mentioned, information about Briquet’s papers in the library at Geneva is available on line on the website of the Thomas L. Gravell Watermark Archive at the University of Delaware, coordinated by Daniel Mosser, which can also be interrogated through the Bernstein catalogue interface (Google and thou shalt be answered). The project for the archive itself goes back to 1995, as part of the build up to the important Roanoke conference the following year (collected in the volume Puzzles in Paper). No precise chronology is furnished, but from indications in the entries themselves, input happened in a series of tranches between about 2007 and 2013, so that at the time of writing in 2017, according to the interface of the site itself, the total of digital images and entries amounts to 5,547 items. Despite the fact that more recently the project seems to be languishing in financial and motivational doldrums, it should be clear that this is a magnificent resource and, were it completed, it would be extraordinarily useful. But there are matters for complaint that require serious consideration. First, the website has software issues. When I first used it extensively, in 2015, searching for the “Repository name” among the “Artifact fields” refused to work and I had to experiment a variety of methods to get a result (I add that criticism about this feature of the website appears elsewhere, so for once I am not the only griper). The problem appears now to have been resolved, but glitches pop up quite frequently in other searches. Second, the cataloguer, or cataloguers, presumably native English-language speakers, seem to struggle in deciphering Briquet’s handwriting, which is not especially bad, by the standards of its time (I have seen and coped with far worse). So, all too often, and far too often, information in the tracings is erroneously transcribed or not transcribed at all. It is unkind, perhaps, to expect international researchers, who have little or no knowledge of French and want to use this resource, to have to struggle with what is written on the tracings, when it could easily be provided and interpreted. Most annoyingly, every reference to the archive or book shelfmarks is ignored. For instance, a shield watermark in the library at Udine, n. 3850 in the online resource, is catalogued as “1570 (? )”, but the tracing itself tells a more complex story: first of all, the doubt about the date is Briquet’s, since he writes “Annal. 57 58”, followed by “59 de 1575”, at the top of the tracing and “Udine 1570?” at the bottom, with “feuilles de garde” and “1574?” immediately above. What does this mean? It signifies that he found this same watermark in three separate volumes of the Annales, belonging respectively to 1570, 1574, and 1575, queried the date to himself, and in the end excluded this mark from the published version. Quite rightly so, since the sheets involved, being endpapers, are from the end of the Seventeenth century, when the Annales were bound up in volume form (admittedly the Gravell Watermark Archive cataloguers could not have known this last fact, but the reference to endpapers provides a clue for anybody who knows anything about bindings). Anyone using the Gravell Watermark Archive as a resource to explore Briquet’s unpublished marks for a particular provenance or period should take note therefore that these features are not always fully or properly identified in the catalogue, and consequently that the chronological or topographical references to a certain year or place in the search engine may not be complete. Again, just to give a couple of casually chosen examples, the entry for a 1457 anchor watermark from the Archives Municipales in Dijon, n. 4860, fails to record where the document was written, i.e. Arc-en-Barrois in the Haut-Marne; likewise, another anchor watermark, this time in the collection at Udine, n. 5224, is dated as “1572”, but Briquet writes a “7” in French fashion, with a crossbar, so that the correct date is 1512. Other examples abound, even in a fairly superficial reading, but space is at a premium. Third, no explanation is provided about the Briquet numbers on the tracings, though they are included in the catalogue entry, albeit sometimes mistranscribed, as though they were part of some greater sequence. As explained above, they are instead the key to Briquet’s archive sources and also to his journeys, so that a single number, as in the instance of the Udine Annales, i.e. 9024, can either cover a hundred and more tracings, or alternatively refer to a single document. Correctly interpreted and compared to Briquet’s travel diaries, these numbers not only make it simpler to identify the precise source of the document, but also allow us to know when Briquet made the tracing, i.e. numbers 8981 to 9025 belong to August 1898 and his trip to Udine, and so on. Surely, this is information worth including? Fourth, and most important, it is not sufficient, to my mind, just to throw the image into the internet with a minimum of catalogue description and hope for the best. As will shortly be demonstrated, the majority of the images in the unpublished part of the Briquet archive form the corpus of secondary references and, with a modicum of extra effort, can be endowed with significant meaning as such. Just to give a very specific and entirely practical example (or go for the jugular), of what can be done with this material, when one makes an effort. A search for the Biblioteca Civica in Udine, as a repository, in the Gravell Watermark Archive threw up 86 records (matters are not entirely helped by the fact that the library there is designated the “Biblioteca Communale [sic!] (Udino [sic!])”. Just for the record, Briquet does not provide an index of the archives and libraries he visited, though the omission is remedied in the 1968 Jubilee edition, pp. *87-*93, but he knew the Udine library as the “Biblioteca Comunale”; however “Civica” is the more modern and actual nomenclature). For reasons I won’t go into here, I chose to focus on the single instance of what Briquet terms a “Basilic”, but according to the Gravell Watermark Archive, n. 6530, is a “Dragon” (I go with the latter, while leaving Harry Potter dragonologists the task of deciding whether the species is a Hungarian Horntail, a Ukrainian Ironbelly, or something different altogether). 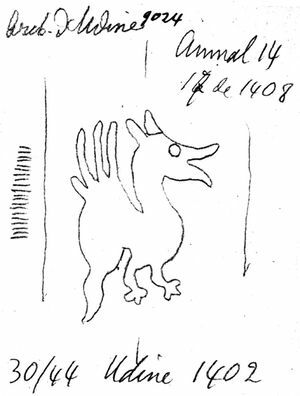 This design of a fiery beast is characteristic of Fabriano and Pioraco, where the records published by Aurelio Zonghi in 1884 tell us that bales of paper with the watermark of a “dragho” were sent to the Tuscan port Talamone by Lodovico d’Ambrogio between 1364 and 1366. Briquet’s tracing, of which the original is held at Papiers Briquet, Box 78, Envelope 22 [Figure 1], refers to volume 14 of the Annales, covering the years 1400 to 1402, which in Les filigranes supplies primary references for two other watermarks, i.e. nn. 3175 (Cercles deux) and 9933 (Licorne). At the bottom of the drawing Briquet notes the sheet-size in cm “30/44”, and the date and place: “Udine 1402”. At the top, in a second moment, he adds a further: “17 [originally 16, cancelled] de 1408”. The oscillation in the dates, i.e. 1402 or 1408, makes it easy to identify a secondary reference in the published sequence for “Basilic” in Les filigranes, i.e. entry n. 2638, which reads: “Marseille, 1410. A. Bouches-du-Rhône, B. 1945: Cptes. Var. ident. : Udine, 1402-08; Calais, 1403; Provence, 1407-10”. Here it is unusual that Briquet did not reproduce Udine as the earliest image in the group. Figure 1. Charles-Moïse Briquet, Tracing in Geneva, Bibliothèque de Genève, Papiers Briquet, Box 78, Envelope 22. Image by courtesy of the Bibliothèque de Genève. To take things just a step further (given that in Udine the Biblioteca Civica is only a short distance from the university), a first-hand examination of Annales, volume 14, discovered the dragon watermark in the gathering forming ff. 352-385. The said volume covers the years 1400-1402, albeit with a few entries for 1404 and 1405 in the final leaves, while the gathering with the fiery reptile design specifically relates to the period 29 July to 18 September 1402. The seventeen sheets of the gathering in volume 14 have twin right-hand and left-hand watermarks, both mounted on supplementary chainlines, distant 29-30 mm from the surrounding chainlines, which are more widely set at 38-39 mm, while Briquet’s measurement of the sheet-size, allowing for the distortion of the binding, is absolutely correct. The marks are easily told apart: in the eight examples of the left-hand watermark (MsR), the thin-necked, narrow-mouthed dragon straddles the supplementary chainline [Figure 2]; in the nine examples of the right-hand watermark (MsL), the thick-necked, wide-mouthed dragon has both legs in front of the supplementary chainline [Figure 3]. Comparison shows that Briquet traced the left-hand watermark (MsR) from the felt side of one of the four blank leaves in which the sign is extremely clear and not impeded by writing (ff. 379, 382, 383, 384). The other chronological reference in the tracing puzzled me, until I understood that it was an indication about the reappearance of the watermark in volume 17 of the Annales, containing years 1408-09, where a search uncovered a group of one right-hand (MsL) watermark at f. 103, and three left-hand (MsR) watermarks at ff. 107, 108, 119, most of them obscured by handwriting. Deciding whether these were the same marks, albeit somewhat aged, or different marks, albeit with the same provenance and shaped on the same pattern, required lengthy scrutiny and comparison: the one clear image at f. 119 shows a thick-necked, wide-mouthed dragon, in the left half of the mould (i.e. the inverse of the situation six years previously, though of course it did happen that marks were taken off the moulds for cleaning and reattached in reverse) [Figure 4]. On the whole, though, there was a sufficient slight diversity of elements to conclude that the watermark was not the same, although it was certainly made on the same original pattern. A further singleton right-hand (MsL) watermark is found at f. 220 and differs more markedly with respect to Annales 14. So, if Les filigranes is taken, as it should be, as a repertory of watermark designs, the reference to volume 17 is acceptable; if, on the other hand, it is to be interpreted as a repertory of individual marks, Briquet is wrong, albeit understandably so, and this ambiguity is central to understanding the man and his method. Figure 2. 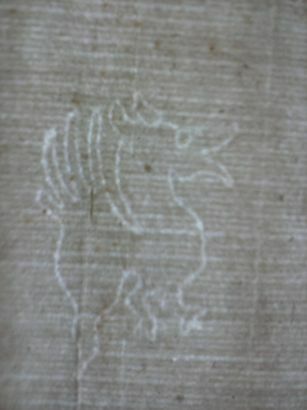 Left-hand (MsR) watermark from Biblioteca Civica “Vincenzo Joppi”, Udine, Archivio Comunale Antico (ACA), Annales, vol. 14, f. 382r. Backlit photograph from the mould side. Image by courtesy of the Biblioteca Civica Vincenzo Joppi”, Udine. Figure 3. 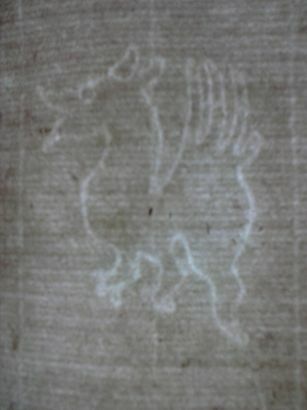 Right-hand (MsL) watermark from Biblioteca Civica “Vincenzo Joppi”, Udine, Archivio Comunale Antico (ACA), Annales, vol. 14, f. 352v. Backlit photograph from the mould side. Image by courtesy of the Biblioteca Civica “Vincenzo Joppi”, Udine. Figure 4. Left-hand (MsR) watermark from Biblioteca Civica “Vincenzo Joppi”, Udine, Archivio Comunale Antico (ACA), Annales, vol. 17, f. 119v. Backlit photograph from the mould side. Image by courtesy of the Biblioteca Civica “Vincenzo Joppi”, Udine. To sum up, the application of new technologies to old problems offers exciting new possibilities, but also requires a more rigorous and active method. Most importantly, an accurate reconstruction, taken from Briquet’s original materials, of the libraries visited and the documents inspected, as well as a first-hand analysis of his unpublished tracings, should be able to decipher most, if not all, of the secondary references in Les filigranes, which could thus be acquired by the said databases. It would be an epic undertaking, but the exercise performed here shows that it is perfectly feasible and worth attempting. Briquet is a system. Briquet is a way of thought. The most common and banal failure in subsequent scholarship is not to understand that his great work is not in any way a repertory of watermarks, but of watermark designs. His objective at all times is to give the earliest known date at which a certain design, or variant in a design, first appeared, and it is rarely possible to improve on him in this respect. For this reason, there is an undoubted prejudice in favour of the Thirteenth and Fourteenth centuries, to which has to be added the fact that every time he came to a new archive he asked first to see the oldest documents; those from the Fifteenth and Sixteenth centuries were viewed only if, and when, he had time to spare. Three things that Briquet did not do are: first, he never tells us whether the tracing is taken from the mould or the felt side of the sheet. In the small sample of examples analysed by myself in the archives at Lyon and at Udine, where the original mark has been compared to the tracing, mould-side prevails, but this is probably due to the general fact that the watermark is more visible from the mould side than from the felt side. The tracings in the Geneva archive also reveal that in the final printed version images were sometimes turned around, so that the designs were almost all facing the same way (a small point, but it does enormously facilitate comparison). Second, he doesn’t say whether the mark is in the right or left-hand side of the mould (nor does any other major repertory). This is actually a matter of some importance, especially when the objective of research becomes to identify twin watermarks. One fact, for instance, about which no data has been gathered, is when the right/left alternance became the prevalent system. A quick survey of the Annales at Udine shows that the situation was decidedly variable in the middle of the Fourteenth century. In volume 1, covering the years 1345-53, for instance, except for one slender gathering containing a single mark, all the gatherings contain distinct pairs of watermarks, presumably made in North-Eastern Italy or at the furthest Fabriano, with designs of a towered gate, bells, cross-bows, a key, an eagle, a weight, and a unicorn’s head. In five instances both watermarks were placed in the left-hand side of the original moulds, in four in the right-hand side, and in three alternately in the left- and right-hand sides. The sheer amount of variance shows that no one system was in place and that the positioning of watermarks was left up to individual mould makers. The Udine archive is a remarkable example of a single run of paper over nearly five centuries and, with further exploration, could certainly provide a preliminary answer to the question about the placing of left- or right-hand watermarks. Although acquired on a much more random basis, my experience of Fifteenth-century Italian paper in printed books suggests the alternate system prevailed more or less universally by the second half of the century. It was interesting to note however, in the Archives Municipales at Lyon, that in French Fifteenth-century paper it is still not unusual to find both watermarks in the same half of the mould. For instance, the anchor watermark from ms. CC.74, containing “Taxes perçues au nom du roy” in 1454, has twins both placed in the left-hand (MsR) of their respective moulds, and they are so alike that it is extremely difficult to decide which one Briquet traced for his n. 401. Likewise in Gerardy’s 1980 study, describing the paper in the archive at Fribourg in Switzerland [6k], covering the years 1402 to 1456, a summary count shows that in 27 instances the twins are both in the left-hand side (MsR) of the moulds, in 16 they are in the right-hand side (MsL), and in 59 they are in alternate left and right sides. While both in the left or both in the right side dominates at the beginning of the century, along the chronological time line the alternate method increasingly prevails. Though much more work is needed, it seems therefore that the system of placing twin watermarks in opposite halves of the relative moulds was introduced at different times in different geographical areas, becoming uniform by the end of the Fifteenth century. Third, as Stevenson observes in his great study on the Missale speciale, Briquet does not always pick up on changes of state in the life-span of the same watermark, so that in some cases the same figure appears twice, albeit in one instance in its youth and in the other in extreme old age (but then how many of us are recognisable in our teenage photos?). In particular, scholars have voiced perplexity about the way in which Briquet treats look-alike or very similar watermarks. His classification employs three grades of diminishing closeness: identique, in which the watermark appears exactly the same; divergente, in which some small difference is discernable; and similaire, in which the distinction is more marked (to be honest, the phrasing of his formulation, see below, is ambiguous and it is not entirely clear whether similaire or divergente represents the greater degree of variance. It is of little real importance, since the latter term is hardly ever used). In particular, in his 1968 introduction to the Jubilee edition of Briquet, Allan Stevenson furnishes the following criticism of Les filigranes: “As all handmade paper has been manufactured on twin moulds, employed together at the vat, collections of watermarks should show both members of a pair. Together the two marks that make one paper greatly increase the ease of identifying that paper, even when they occur underneath type, for one of the marks may be confusingly similar to another mark. Briquet was misled by an imperfect understanding of these companion marks and their function for paper study, and was hampered by the economic necessity of presenting as many marks as possible. As it was, he cut his collection from some 60,000 to 16,112, thus jettisoning numerous twins, as we learn from examining the Briquet Archive at Geneva. The fact that inclusion of twins would have made a more valuable work is apparent in those few instances where twins did get in” (p. 18*). There is a touch of unfairness in this remark and, if the truth be told, elsewhere, for instance in the introduction to Briquet’s Opuscula in 1955 and in the Kansas lecture of 1961, Stevenson shows a much better understanding of the limits and practicalities of his precursor’s working method, making the – to my mind – all important point that Briquet had little or no way of telling where twin watermarks were involved. Since this criticism surfaces in other writings about paper – for instance, it is cited in the presentation on the Gravell Watermark Archive – by scholars who perhaps have a lesser comprehension of the matter, it is worth clarifying this particular judgement once and for all, also because Briquet himself makes a very misleading claim. Nous nous sommes demandé s’il n’y aurait pas un autre moyen d’évaluer le temps écoulé entre la fabrication d’un papier et son emploi, en se servant dans ce but des filigranes identiques. Entrons ici dans quelques détails nécessaires: chacun sait que dans l’ancienne manière de faire le papier on se servait de deux moules ou formes que l’ouvrier plongeait alternativement dans la pâte. Le papier produit, portait donc par parts égales l’empreinte de chacune des formes employées et ce mélange se voit dans chaque rame et dans chaque main de ce papier. Ces deux variétés du filigrane sont parfois identiques au point qu’on ne les distingue que par la place un peu différente que chacune d’elles occupe sur la feuille de papier. Parfois les deux variétés sont divergentes, voy. coupe (nos. 4542 et 4543), couronne (nos. 4791 et 4792), croix grecque (nos. 5525 et 5526); le plus souvent elles sont similaires n’offrant entre elles que des différences légères de forme ou de dimension, voy. pot (nos. 12.893 et 12.894), serpent (nos. 13.801 et 13.802), tête de bœuf (nos. 14.388 et 14.389). Translation: we have asked ourselves whether there might not be another way of establishing the amount of time that passed between the making of paper and its consumption, using for this purpose the identical watermarks. Here some technical detail is necessary: everyone knows that in the old way of making paper, two moulds or formes were employed that the vatman dipped alternately into the pulp. The paper so produced bore therefore, in equal proportions, the imprint of each of the two moulds employed and this alternation is to be seen in every ream and gathering of the same. These two variant watermarks are sometimes identical to the point that they cannot be told apart, except for the different position they have on the sheet of paper. Sometimes the two watermarks are divergent, see coupe (nos. 4542 and 4543), couronne (nos. 4791 and 4792), croix grecque (nos. 5525 and 5526); more often they are similar, showing only small changes in shape and size, see pot (nos. 12,893 and 12,894), serpent (nos. 13,801 and 13,802), tête de bœuf (nos. 14,388 and 14,389). What Briquet unequivocally states here is that all his indications of identique, divergente, and similaire, should be taken as identifying twin watermarks; the claim, however, is not just implausible, it is impossible. As has already been shown in the previous chapter, the identification of twin watermarks is a matter of inference and depends on finding a consistent nucleus of paper, in which the same two watermarks are present in approximately the same quantity, without the intrusion of other sheets containing analogous marks to create uncertainty. If the said watermarks are furthermore separable in terms of right and left, so much the better. Briquet’s indications of identique, and so on, rarely if ever refer to the same original document, which, as he himself makes clear in the passage quoted here, is the essential prerequisite for identifying twin watermarks; almost invariably the reference is instead to documents in different collections, sometimes visited years apart in time, and therefore it is unthinkable that he could have established twinship with the quantity and the quality of the information he had gathered. Likewise, none of the tracings I have so far encountered in the Briquet archive make any reference to twinship. It is worth taking a better look at the six examples, or twelve watermarks, Briquet himself cites in the passage quoted just above. In reality and with sublime irony, these are perhaps the few instances in which Briquet deliberately provides references to twin watermarks, albeit not quite, and excepting those cases in which he didn’t really intend to. For two of the entries, the Coupe in 1431-39 and the Serpent in 1479-85, the source is the archive in Geneva, Briquet’s home town, where obviously he had time for a longer and more leisurely scrutiny than those permitted in his travels. Likewise, for the Croix grecque, again a Geneva watermark from 1408, in the double-bracketed entry he writes: “Filigr. posés presque au centre de la feuille … Ces deux figures se trouvent toujours ensemble et paraissent être produites par une seule paire de formes” [translation: watermarks placed almost in the centre of the sheet … these two figures are always found together and seem to have been made by the same pair of moulds]. As far as I am aware, this statement is almost unique in Les filigranes, while the unusual placing of the mark makes it probable that he is right. For the Pot and the Tête de bœuf, respectively at Angoulême in 1550 and Lautrec in 1444-47, the coincidence of dates and the archive source make twinship highly probable, though if someone were to have a look, that would be nice. The Couronne mark makes reference, however, to two Fifteenth-century printed books, both published in 1484 in Harlem by Jacob Bellaert, and generates a weird little, or perhaps not so little, situation. The Seelentrost published on 9 August 1484 is ISTC is00361000, where an immediate link is provided to the wonderful Watermarks in the Low Countries (WILC) online repertory, which duly reproduces the twin crown watermarks in the edition with very clear electron radiographs . Briquet 4791 does not take the watermark immediately from the incunable, but from a previous essay on watermarks in France published in 1868 by Etienne Midoux and Auguste Matton. The marks concerned are nn. 239 and 240, which in the earlier article are reproduced in lithograph with their position with respect to the chainlines, albeit without reference to the wirelines or the measurements. Even more curiously, as far as Briquet’s treatment of these marks is concerned, is that Midoux-Matton give as their source the archive in Laon, without making any mention of Dutch incunabula, and further have nothing whatsoever to say about twin watermarks. It goes without saying that the various passages have not improved the accuracy of the tracing, but n. 239, or Briquet 4791, corresponds approximately to the left-hand (MsR) watermark, WM I 1112, in WILC (which designates it as “right”, seen from the mould side). The other watermark traced by Briquet, i.e. 4792, taken from Midoux-Matton, n. 240, is not the twin, or the right-hand watermark (MsL), in WILC. The latter corresponds instead to WM I 1395 (designated as “left”, seen from the mould side), in all respects almost identical to its sister mark. Briquet 4792 does not appear anywhere in the 1484 Seelentrost; it does surface, however, in the other title he cites, the Boeck des gulden throens, translated into Dutch from the German original of Otto van Passau, published on 25 October 1484, or ISTC io00125000, which again has a link to WILC (when technology and genuine research interact, it can be quite engaging!). The twin Crown watermarks here, WM I 692 and 693, albeit generically similar, really do not match the image in Briquet. Certainly, before drawing any definite conclusion about either of these watermarks, it would be best to return directly the source of Midoux-Matton, held in the beautiful city of Laon and published a long time ago in 1868. How much credence should we give therefore to Briquet’s claims about twin watermarks? None whatsoever is probably the best answer. Without, however, in any way diminishing Briquet or the greatness of his achievement. It is necessary on the other hand to understand the very serious limitations posed by the accuracy of tracing as a method on the one hand and by the extreme rapidity with which Briquet worked on the other. His terminology is an accommodation to these two uncomfortable facts. Very simply, Briquet did not have time, nor the technology, nor the desire to chase twin watermarks. When he departed for one of his archive-and-library-visiting trips, a journey which could last up to six months, using the relatively new-fangled European railway network, it is implausible that he took with him his entire working archive; it necessarily stayed in Geneva, since, quite apart from the risks of the journey, 60,000 records constitute a notable mass of material. Once he returned from his travels and began the task of classifying and matching up the new harvest of tracings, which would obviously be several thousand in every journey, Briquet had to face several questions about the relationship between his new data and what he had already garnered, sometimes ten to twenty years earlier. Was it the same watermark? Was it the same watermark at a different stage of its earthly existence? Was it the same watermark, attached differently to the mould, or to another mould? Was it the twin watermark from the sister mould? Was it the twin watermark in an earlier or later state? Was it a mark from a different pair, but shaped around the same pattern? Was it another mark altogether, but still fairly look-alike? The answer to all these questions is that he could not know, because all he had for the comparison were two tracings (even Stevenson, when he correctly evaluates the limits of Briquet’s method, makes the mistake of assuming that Briquet compared at least a watermark with a tracing, but this is clearly unlikely). Now of course the easiest way to compare two tracings is to superimpose them in order to establish whether they are indeed the same shape and size. If they are, it is what I think Briquet intends by identique, but the recognition can go no further. Our exploitation of what he provides must therefore take a full and proper account of this uncertainty. More significantly, the whole discussion around twin watermarks has constantly begged and largely ignored a more important issue, i.e. the pattern on which the watermarks were shaped [see the previous Chapter]. These were simple objects, a pencil drawing on a small piece of wood, nails hammered in at key points, after which the wire was bent round the nails to form the watermark. A single pattern, however, potentially produces an infinite number of watermarks of the same size, which can be attached to successive moulds over an extended period of time. This simple fact signifies that to say “watermarks are twins” is already a considerable simplification: the family unit is often much more extended and may include sisters and brothers of every kind. My own experience of Medieval and Renaissance paper has regularly found that identifying twin watermarks is splendid in theory and far from straightforward in practice. Just to take an example, manuscript CC.105 in the Archives Municipales at Lyon, is made up with a series of gatherings, in folio format, written in 1488 and 1489. Briquet looked at it over a century ago and traced a “main”, probably from the felt side of f. 206 (n. 11548), and a “soleil”, probably from the felt side of f. 234 (n. 13917). He does not appear to have manifested any interest for the third watermark found therein, a “roue dentée”, similar to nos. 13447-52, even though a clear image, unencumbered by ink, is visible at blank f. 317, but it is quite possible that the tracing ended up in the collection of discarded images (where I still have to look for this particular item). Following in his footsteps, I inspected this volume in a stay at Lyon a few years ago, courtesy of the Musée de l’Imprimerie. There are two separate groups of hand, or glove, watermarks. The larger, comprising the sixty sheets ff. 41-84, 87-136, 187-206, was made on a pair of moulds, in which both watermarks were placed in the right-hand half of the mould (MsL). As quite frequently happens and as my notes duly show, my initial impression was that there were three, possibly four, different watermarks, so that it took the best part of a day before the distinguishing traits of the twins were clear in my own mind. Another set of hand or glove watermarks supplied ff. 137-186: here the sheets are quite thick and the images are faint, so, apart from noting some differences between the two moulds, I did not persist. The sun watermark appears in a gathering containing only six leaves, ff. 234-239: unfortunately, all three watermarks are from the same mould, where the mark was placed in the right-hand side (MsL), so the twin is not available. In my opinion this is a manuscript of medium complexity. Many are simpler, providing left-hand and right-hand, or sometimes both from the same side, watermarks that are easily recognised as twins. There are however plenty of more complicated situations, in which the twin marks are virtually indistinguishable or there are four or six similar watermarks and no way of telling the pairings apart. Where Briquet flicked rapidly through the manuscript, selected the images he wanted, and made his tracings in a matter of minutes, anything more thorough, especially the identification of twins, involves a fifty-fold increase in the amount of time and effort. Briquet made his choice and today we have Les filigranes as a finished work. Of course, there is an acceptable solution to this dilemma. If you really desperately need to know whether the watermark recorded by Briquet is the same as that in the document that interests you, you only have to get on a plane, a train, a bus, and follow the trace back to the library or archive where Briquet first found it. Indeed, if the source is a printed book, most often an incunable, the task is simplified by the fact that a library near you might hold a copy. Though awkwardnesses can arise with the brevity of the indication (as we have seen with the “1282” watermark at Bologna), or if the reference is a secondary one, Briquet is generally scrupulous (and on the whole much better than other watermark scholars) in the way he lists his sources, at least as far as the primary references for his tracings are concerned. Even a century later most of the collections he visited are still extant and librarians and archivists are usually able to put their hands on the documents concerned (as proved to be the case both in the Archives Municipales at Lyon and in the Biblioteca Civica at Udine). But some modern scholars, not necessarily paper historians, although perfectly willing to criticise, appear strangely averse to the idea that they should get up off their chairs and go and look at some real watermarks. In the course of over a century the only researcher systematically to have followed in Briquet’s path, for at least a small part of the way, has been Allan Stevenson. In his wonderful introduction to the 1968 Jubilee edition, he provides some cogent examples of Briquet watermarks which he had traced back to their source, for instance, a pair of unicorn marks in the blockbook of the Canticum Canticorum in Dutch, attributed on the basis of the paper and other evidence to Bruxelles and the year 1466. Here is the story he tells: “The British Museum impression [IB. 16; BMC I, 6] contains just one paper, marked with twin prancing Unicorns: Br. 9991 and 9993! If I had my doubts, I resolved them at Metz through making photocopies and sketches, both showing sewing dots. What is notable is that Briquet here gives us both members of a pair: twins. This happened because he found one Unicorn in the departmental archives at the Prefecture and the other in the municipal archives across the road from the Bibliothèque, and failed to recognise them as twins because the first is a copied document. Actually the marks date from 1465 rather than 1466 [Briquet actually suggests “1463?” for n. 9991, which he notes is a copy of a document of an original of a slightly earlier date, and “1466” for n. 9993]” (p. *26). In the plates following p. *36, Stevenson provides two excellent β-radiographs of the said twin unicorns, albeit without telling us more (for instance, which is left and which is right), making it possible to compare quality photographs with Briquet’s images. As an example of method, and how Briquet should be approached, it is absolutely perfect, especially in demonstrating that even when the great filigranologist included twin watermarks, it was probably quite unintentional. The only regret is that Stevenson never did it on a larger scale. The example of Briquet, even following his first pioneering article in 1888, was obviously huge and every watermark repertory published subsequently has been immensely in his debt. Some works, however, follow particularly closely in his footsteps, even to the extent of using the same material, and so merit close scrutiny. The most explicit continuation and extension of Briquet’s repertory, whose importance and significance has been missed by just about everyone, including myself in the first version of this text, which is strange, since the book concerned is easily found on the shelves of rare-book rooms (and thus confirms that paper historians are not good at browsing). The title in pure, idiomatic Serbo-Croat might, on the other hand, have proved off-putting, as well as the initial impression of a survey of watermarks in the archives and libraries of what at the time was Yugoslavia. The work is the Vodeni znakovi XIII. i XIV. vijeka, by Vladimir A. Mošin (pronounced mo-shin) and Seid M. Traljic (pronounced trig-lich), published in Zagreb by the Jugoslavenska Akademija Znanosti i Umjetnosti, Historijski Institut, in 1957. Fortunately, the work has a parallel title in French, i.e. Filigranes des XIIIe et XIVe ss., also regarding the publisher, which is the Académie Yougoslave des Sciences et des Beaux Arts, Institut d’histoire. It reproduces 7,271 watermark designs ordered in Briquet fashion, with references to further instances of “identiques” and “similaires” that are not shown. A little over eighty images are simply reproductions of Briquet’s published corpus and as such provide little or nothing that is new; many others, however, approximately 40% of the repertory (at a rough guess), are taken straight from Briquet’s unpublished archive at Geneva, cited as “BI” or “Briquet inédits”, and therefore constitute a major extension of the same. (Rather frustratingly, the introduction is laconic about the use made of Briquet’s materials, in particular about how the tracings were obtained and reproduced. Since the originals are present in today’s archive and it is improbable that they were loaned, the most likely explanation is that they were retraced, with an inevitable loss of detail and accuracy.) Other material is taken for the most part from original documents in archives and libraries, in what at the time was the wrong side of the Iron Curtain, though in most instances the paper was of Italian origin. ● Mošin-Traljić, n. 7191: a “tour crenelée”, where the image is of the only instance of the left-hand (MsR) watermark at f. 8: “1375, Udine (BI 9624 [sic! for 9024]: Bibl., Annal. 1)”. It is traced from the said blank leaf on the felt side, whereas the two examples of the right-hand mark (MsL) at ff. 4-5 are partially obscured by handwriting. The four-sheet gathering concerned (ff. 2-9), i.e. the first in Annales, volume 1, is dated in the original only by a reference to the XIII indiction, or the Medieval system of chronological cycles, which for the Fourteenth century corresponds to 1315, 1345, or 1375. In the margin on f. 2r a later hand, probably Sixteenth-century, has inserted “1345” and for this reason the gathering was placed at the beginning of the volume, when the Annales were assembled and bound up in their actual form in the Seventeenth century (the second gathering is correctly dated 1347). As the original tracing in Papiers Briquet, Box 81, Envelope 13, n. 62, duly shows, Briquet found and annotated the date 1345, but suspected its veracity, since he also wrote on the same: “Certainement copié post ou erreur de date”, and therefore chose not to use it. Interestingly, a subsequent conservator of the library in Udine, Giovanni Battista della Porta, during the first quarter of the Twentieth century, has inscribed a pencil note on the flyleaf, arguing on the basis of internal evidence that the year concerned must be 1375. So Briquet was right to doubt, though at the moment it is not known how or why Mošin-Traljić also made the right correction. Just to complete the picture relating to volume 1 of the Annales in Briquet, an unused tracing in Papiers Briquet, Box 79, Envelope 6, n. 99, not recovered by Mošin-Traljić, but now available in the Gravell Watermark Archive, n. 8514, shows the watermark of a key. The image matches the left-hand watermark (MsR), one of a pair in the fourth gathering (ff. 90-131), dated 1348, which Briquet traced from the felt side and to which he makes a secondary reference when citing a list of variant designs in n. 3813 as “Udine, 1346-54”. One of these designs cited in this secondary reference is the unpublished key watermark, dated 1354, from Annales, volume 2, in Papiers Briquet, Box 79, Envelope 6, n. 103, also in the Gravell Watermark Archive, n. 8518. A more thorough exploration of the still unpublished collection of tracings, since what I have done so far is a mere sample, might add something more. Vladimir Mošin pursued his re-elaboration of Briquet with two more thematic publications. The first in 1967, in collaboration with Mira Grozdanović-Pajić, brought together from numerous previous repertories the images of the agnus paschalis, or Easter lamb, from 1327 to 1817 . If in the total of 338 entries most of the pre-1600 items have been previously published, mostly in Briquet, the Seventeenth-century material is taken mainly from archives in what at the time was Yugoslavia. The paper, however, was mostly Italian in origin and the repertory is especially valuable for the attention it pays to countermarks and other additional signs. His subsequent collection of Anchor watermarks, published in English in 1973, lists and reproduces 2,847 watermark designs from 1376 to 1832, organized by design families on a chronological basis. If on the one hand it involves the duplication and expansion of large extant series, such as Briquet, nn. 345-593, and Zonghi, nn. 1583-1642, it does include examples from less known sources, such as Ferdinando Ongania’s history of printing (Venezia 1894), and adds much new exemplification taken directly from manuscripts and printed books in the collections of Eastern Europe. Another repertory which deserves mention, en passant and perhaps more, is that by Johann Lindt for the history of papermaking in Berne published in 1964 [6k]. It includes 787 numbered tracings (in reality 788), covering the period from 1465 to 1859, mostly comprising a bear. Where it is significant is that in many cases the tracings are for twin watermarks, which are linked together in the index. Obviously this is a major step forward in the identification of paper stocks, though some gripes are also possible, for instance, there is no information about which side of the mould each watermark is positioned, and so on. The other great watermark resource in printed form, which is commonly found, alongside the master himself, on the shelves of rare book rooms, is the series of seventeen Findbücher, in 25 tomes, by Gerhard Piccard (1909-89), published from 1964 to 1997, containing some 92,000 reproductions of tracings , so almost six times larger than Les filigranes. The method is essentially that of Briquet, albeit with some minor differences, so it is worth examining this immense work of scholarship in the light of what has already been said in this chapter. Piccard covers a significantly longer time-scale than Briquet, albeit with variations from volume to volume, but generally up to the end of the Seventeenth century and at times into the early Nineteenth, thus covering much or most of the handmade paper period. The geographical area is perhaps more restricted, concentrating for the most part on the course of the Rhine from Germany to the Netherlands, but with significant incursions into Northern Italy, while France is relatively neglected. On the other hand, there are drawbacks, both in method and in execution, since on the whole Piccard appears less skilled than Briquet in his tracings, which were redrafted for publication purposes by redrawing the original pencil trace in India ink, and in his ability to recognise marks. It has been observed by Paul Needham in his 1985 study of the paper in the Gutenberg Bible, for instance, that in Wasserzeichen Frucht, nn. 1147-1160, Piccard reproduces the twin grape watermarks found in therein a total of fourteen times (p. 318). This signal failure to recognise that these are the same pair of marks does not induce confidence. In the first three volumes of the series, moreover, the watermarks were not reproduced according to their original sizes and the indications about wire and chain-lines were removed, presumably for “aesthetic” reasons, though these faults were subsequently remedied. A further weakness in Piccard’s approach is the omission, in numerous instances, of the countermark accompanying the watermark. Since the presence of a countermark tells us that the paper almost certainly comes from Venetian territory, in particular in the mills on and around Lake Garda, the exclusion is a serious deficiency. For the purposes of our detailed analysis, let us look at the by now familiar and friendly matter of dragon watermarks. Piccard describes them in his tenth Findbuch, published in 1980, containing mythical creatures, so also griffins and unicorns. Compared to Briquet’s 109 entries (nn. 2618-2726), Piccard provides 764 images, a seven-fold increase (nn. 201-964), but with relatively few secondary references. The descriptive entry indicates the placing of the watermark on the chainlines, the number of wirelines covered by the watermark, the place of origin of the document, and the date of the same. Unlike Briquet, no information is given about the measurements of the sheet and nothing is said about where the document is presently held, and these are both important omissions. The other significant, and innovative, feature is that some watermarks are indicated as being pairs or twins, i.e. “Bei der Produktion ursprünglich zusammen gehöriges Formen – bzw. Papierzeichen Paar” (p. 16), with a designation “A” and “B”. For instance, nn. 372 and 373, found in documents written at Ferrara in 1400 and at San Pietro in 1401, are indicated as twin watermarks; sometimes, however, differences in design lead to separation, such as n. 375 in a document from Parma in 1431 is the A twin associated with the B twin at n. 419, with the same origin and date. The usefulness of this feature is impaired somewhat by the lack of ancillary information, i.e. whether the tracings are from the mould/felt side, whether the marks are placed in the right/left hand side of the original mould, and whether the identification of the twins is based on a significant quantity of paper. 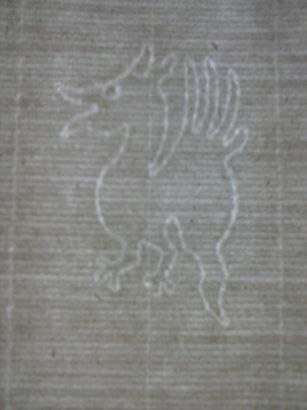 One obvious and important question was whether the pair of dragon watermarks from Annales, volume 14, in Udine, were recognizable among those described by Piccard. Some are certainly very close, for instance, nn. 280 and 283, given as twins in documents written in Utrecht in 1401, obviously on paper imported from Italy. They share the characteristic that n. 280 has its back leg in front of the chainline and n. 283 behind, a feature found in other pairings, such as nn. 275 and 285, on documents written in Xanten in 1403. On the other hand there is a sufficient number of differences, for instance the missing horizontal wire on the front ear, to show that they are different marks, albeit probably all from the same original pattern. Apart from the limitations of tracing as a surefire method of recognition, the failure of the repertory to say where the documents are held formerly made it nigh impossible to check the originals: the publication of Piccard’s tracings online does not, as yet, include nn. 280 and 283, although it does tell us that nn. 275 and 285 came from the Stiftsarchiv in Xanten. The other very important aspect of Piccard’s research is that his huge archive of published and unpublished drawings has taken on new being in one of the most important and innovative projects in the field of watermark studies on the website of the State Archive in Stuttgart, as the “Digital Publication of the ‘Piccard’ Collection of Watermarks”; this in turn forms part of an even bigger project, or the Wasserzeichen-Informationssystem (WZIS), involving other institutions in the German-speaking world, which can be accessed directly or viewed through the portal of the Bernstein ‘Memory of Paper’ project , where it is honoured with first place in the list of repertories. The information-technology side of the operation and the quality of the images available for interrogation is absolutely superb; the explanation of what the project actually involves, on the other hand, especially as relates to the Piccard archive, is very unclear and even downright mystifying. So here is an attempt to unravel it. The Piccard material on the Stuttgart Archive site is formed by 37,000 supposedly “unpublished” images; at the time of writing in 2017 WZIS has a total corpus of 133,872 items and continues to grow at a steady rate. It is a sophisticated interface, which takes a while to master, but is worth the trouble. One very useful feature is that the sources for the tracings have been indexed and listed, meaning that individual localities can be checked or studied in depth, with reference directly to the original manuscripts: for instance, I was intrigued and pleased to find 568 entries relating to Udine, albeit not to the Biblioteca Civica visited by Briquet in 1898, but to the State Archive (and about which something will have to be done). What about the images in Piccard’s published volumes? Well, they are also available on line, with exception of volumes 1-2 (comprised in 4 tomes), in a project entitled PPP-Piccard Print Online, on the site of the Austrian Academy for Sciences, which is not searchable through the WZIS or Bernstein interfaces (obviously, the long-term plan is to integrate these images, but in the short term a few words of explanation might prove very helpful). It is nevertheless a very convenient resource, also for the excellence of the download of individual images. Let us again see what happens with a practical example, focusing again with dragons. Beginning with the Stuttgart website, when asked in 2017 about Drache in German, the answer was 222 fire-breathing reptiles; posing WZIS the same question (which can also be asked in English or French), the answer was 354. The “unpublished” Piccard entries, called up by both inquiries, are significantly better in at least one respect with respect to the published version, in that they include Piccard’s annotation of the archive source, which WZIS also transcribes. But there is a small structural problem. Let us take a scaly worm at random, n. 123930 (WZIS allows for searching by reference number, i.e. on the first page click “Extended Search”, followed by “Reference number” in the “Search Watermarks” opening, in order to call up this individual beastie). Scrolling through the dragon/Drache entries on the Stuttgart site, one discovers that this particular flaming lizard appears on a document written in Florence in November 1392 and held by the Datini Archive in Prato; if, on the other hand, the starting point is WZIS, the entry provides a further link to the online published version, identifying the said fiery worm as n. 323 in the printed repertory, where it faces in the opposite direction and has been provided with an eye which is missing in the tracing. So the unpublished images are quite often published, which is – to put it mildly – confusing. If we further take the trouble to go to the printed volume and to consult the index therein, we discover that n. 323 is a singleton without the tracing of a twin (p. 22). To sum up, as far as the Piccard archive is concerned, a single watermark may be described in three different sources of information, none of them entirely complete, i.e. the “unpublished” images of the tracings on the Stuttgart Archive site, which give the source of the original document, but fail to say whether the document is also in the published repertory; the link between the same and the “published” images in WZIS, which can vary in matters of detail; and the original print document, which does not tell us where the document is held, but is the only one to say which watermarks belong together as twins (to be fair, WZIS does include the “A” and “B” labels, but without saying what goes with what, so the paper repertory still has to be verified). To ask an impecunious, struggling watermark scholar to puzzle all this out on their own is somewhat cruel (it took myself a good day and a bit, and plenty of trial and error). These defects which are commonsensical, rather than conceptual or practical, rather mar the pleasure to be taken in an absolutely extraordinary on-line cutting-edge resource, and it is to be hoped therefore that in coming years they will be overcome; until that day comes, please pay careful attention to the explanation given here. Returning to more traditional procedures, in the field of Greek codicology, important work has been done to document and trace pairs of watermarks in manuscripts written in the Renaissance, mostly in Northern Italy. In the first volume (1974) of their Wasserzeichen aus griechischen Handschriften, Dieter and Johanna Harlfinger reproduce some 300 pairs of watermarks from manuscripts in European libraries, for the most part in Germany and Italy; the second volume (1980) added another 300 examples . Subsequent work by American classicist, Mark L. Sosower (1949-2009), limited to Sixteenth-century manuscripts in Spanish libraries (2004), most of them however written in Italy, adds another 760 pairs of watermarks, albeit with the odd singleton . As contributions, they are impressive and anyone grappling with the problem of identifying and describing twin watermarks should be aware of them, since the presentation of tracings of the twins on the same page makes it very easy to recognise differences. At the same time the “Harlfinger method”, common to both repertories, is inadequate in several respects and omits basic evidence: no measurements of the sheet-sizes are provided, no information is given about the placing of the watermarks in the left/right side of the mould, and we are not told whether the watermarks are viewed from the mould or felt side of the sheet. It is yet another instance of hard, meritorious work not achieving its goal through a failure to talk to scholars with parallel experiences in other fields. Just to give an instance, Sosower provides a lengthy discussion of countermarks, without realizing that they are circumscribed to Northern Italy and in particular Lake Garda, with one example he transcribes as “3M”. It is easy to guess that this is “ZM” and almost certainly stands for “Zuan Maria” . As a final aside on Briquet’s epigones, a number of repertories have been published with the explicit intention of extending his work into the Seventeenth and Eighteenth centuries, and consequently are much known and cited, without always being looked at with a sufficiently critical eye. The earliest of these by William Algernon Churchill (1865-1947), published in 1935 , surveys watermarks produced in North-Western Europe, including England and Holland, which were in the process of becoming major producers of paper. It is a valuable historical treatise, but the tracings of 576 watermarks, which fail to include the chain or wirelines, are not well executed. A larger and more impressive repertory, published in 1950 , was that of Edward Heawood (1863-1949), geographer and librarian of the Royal Geographical Society, comprising tracings of 4,078 watermarks. Again, the emphasis falls mainly on watermarks of Northern Europe, many of them taken from maps and printed books. A correction of this imbalance, albeit limited to France, came with a book by Raymond Gaudriault in 1995 . It contains 4,328 tracings, most of them, however, reproduced from previous repertories, with a consequent loss of accuracy and detail. For other watermark repertories, produced on a more regional basis, see .